It's just like your mom always said: When life gives you a plague of rabbits, make a rabbit-pelt billboard. 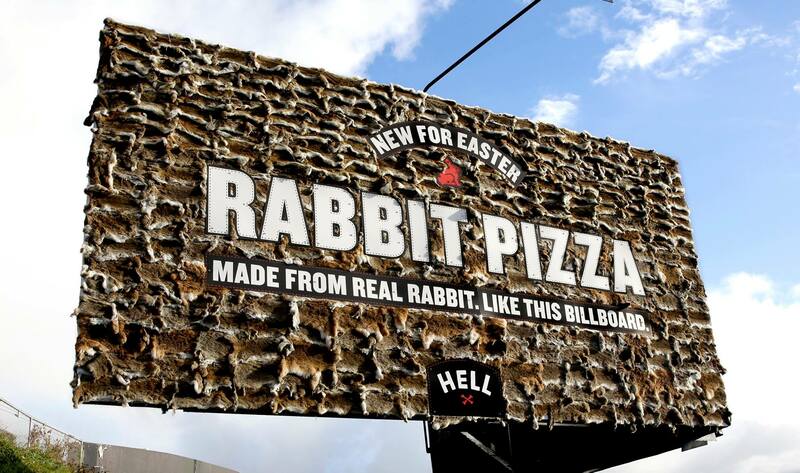 Hell Pizza in New Zealand has been grabbing international attention in recent days with a new billboard advertising its rabbit pizza. The outdoor board is made from hundreds of rabbit skins, which it makes clear by noting: "Made from real rabbit. Like this billboard." Like several parts of the world, New Zealand suffers from an overabundance of rabbits, which can devastate crops and native ecosystems. "As well as being a delicious meat, and even quite cute, rabbits are unfortunately also a noted pest that is damaging to the New Zealand environment, particularly in the South Island," the pizzeria noted on its Facebook page. "For those who are concerned, we sourced these rabbit skins via a professional animal tanning company, who in turn sourced them from local meat processing companies where the skins are a regular by-product." The pizza is made with smoked wild New Zealand rabbit, toasted pine nuts, beetroot and horopito relish, cream cheese, rosemary and fresh spring onions.